Those dancing, singing orphans from the musical “Annie” were on to something — our happiness is more directly correlated to our smiles than we might think. Not only does a smile indicate happiness, scientific studies prove a smile can actually conjure happiness, both in ourselves and for others. The psychology of smiling has been studied extensively, and the data is extremely interesting. Turn that frown upside down and learn how a big, healthy, authentic smile can change how you and others around you feel. It’s important to understand the biology behind smiling before understanding its effects. There are many different kinds of smiles, but only a “true smile” confers these profound benefits. That kind of smile (known as the “Duchenne smile”) is one that engages both the zygomatic major muscles (attached to the cheeks, they pull the lips upward) and the orbicularis oculi (they squeeze the skin beside your eyes into little wrinkles). These two groups of muscles, working in tandem, produce that authentic smile which leads to some amazing mental and physical benefits. The players with the broadest smiles lived, on average, nearly 80 years. Those who didn’t smile lived only 73 years. According to the study, year after year, smiling players were half as likely as non-smiling players to die. 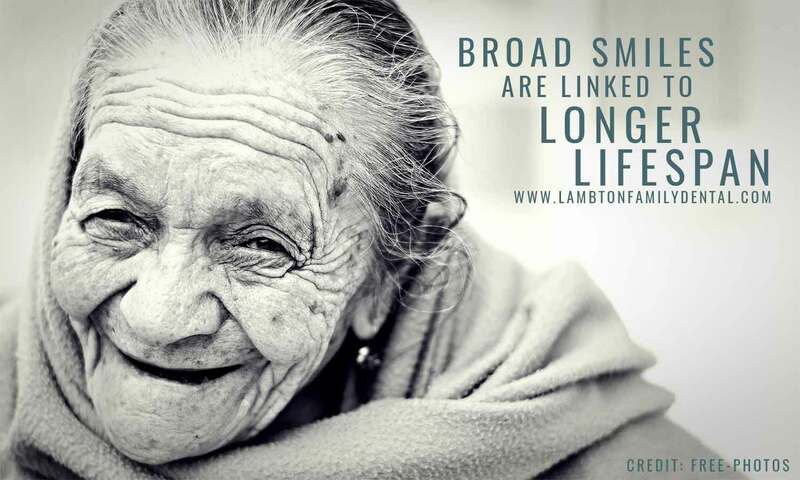 Other longevity markers (such as maintaining personal health and hygiene) are correlated with broader smiles. Amazingly, in a 2016 study from UC Irvine, researchers found that students who smiled for their ID photos were more likely to have visited a health centre in the past year, and even more likely to have done so as a preventative visit. The physical act of smiling releases endorphins, dopamine, and serotonin into your brain. These feel-good chemicals are responsible for a whole host of benefits in the brain. Dopamine is the oldest neurotransmitter and paved the way for evolution, making humans both aggressive and able to control our impulses — a lethal combination. Endorphins are natural pain relievers and act as a body’s very own opiates. Serotonin (another ancient neurotransmitter) helps regulate mood and social behaviour, digestion and appetite, memory, and sexual function. With one big, broad smile, our brain gets a powerful chemical boost. Smiles can be compared quantifiably with other pleasurable physical sensations. A study from Hewlett-Packard Development showed that a smile delivers the same amount of brain stimulation as the equivalent of eating 2,000 chocolate bars. Similarly, these same researchers found that it would take more than a $25,000 windfall to equal the amount of pleasure the brain receives from a single smile. Knowing that, the term “million dollar smile” makes a lot more sense now! The “Duchenne” smile was codified by Paul Ekman and Wallace Friesen at the University of California at San Francisco in the 1970s. These scientists catalogued the precise muscular coordinates behind 3,000 facial expressions to develop what is now known as the Facial Action Coding System, or FACS. FACS was recently used at the University of California at Berkeley to determine that genuine Duchenne smiles could be a predictor of future contentment. Analyzing college yearbook photos of women, they matched smile ratings with personality data and discovered that over the 30 year study, women who at 21 displayed genuine smiles reported greater levels of well-being and marital satisfaction at 52. The brain chemicals that smiling can induce might make us feel better, even when there are no outward stimuli to do so. The physical action of a smile can — on its own — produce a positive experience. Using pencils between the teeth of subjects to force them to physically smile, researchers discovered the subjects felt better. It somewhat addresses how cognitive behavioural therapy works: if you change the behaviour, you can change the emotion. Pack up your troubles in your old kit bag, and smile, smile, smile! Smiling can be contagious — people smile when you smile. There’s an evolutionary and self-preservation reason for this. People automatically mimic a smile because they’re subconsciously testing to see if the expression is authentic or not. When someone smiles at you, you usually reflect it back to them. Your brain is then able to determine how genuine that person is being. Human beings are drawn to beauty and symmetry; this affects how we see other human beings as well. A smile is transformative, and can light up a room. A recent study using an fMRI found that the brain’s orbitofrontal cortex (the region involved in processing sensory rewards) was activated when people viewed attractive faces. The reaction was even stronger when the face viewed was smiling. A follow-up study confirmed these results; those who were excluded showed a greater preference for working with people who display genuine Duchenne smiles. The smile can create long-term contentment — as well as be a mood enhancer, a pain reliever, and a positive social signal. The simple act of engaging two muscle sets in your face can lead to a cascade of positivity and better living. To keep your smile making yourself and others feel better, call Lambton Family Dental in Sarnia, Ontario, at (519) 344-5747 to learn how we can help you manage your dental well-being and keep your smile big, bright, and healthy.